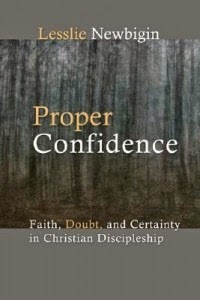 Notes on Newbigin's "Proper Confidence"
Newbigin argues that underlying the conflict between fundamentalism and liberalism is a common assumption. The assumption is derived from a distinctly modern perspective on the theory of knowledge and involves a species of Cartesian foundationalism that Newbigin believes should be challenged. Knowledge, according to Newbigin, is tradition/community constituted, grounded in personal commitment (faith). This is adequate grounds for Christian belief and is the same grounds for any kind of knowledge. Furthermore it is the best assumption for making sense of human experience. Faith is an act of obedience to a person (95). Belief, therefore, is grounded in a personal commitment to a person in his command to believe. Newbigin suggests that there is no neutral perspective from which to evaluate evidence. All theories rest upon assumptions that are rationally questioned. In order to know one must rest on one or other assumption and treat this assumption as if it requires no rational support. There can be no knowing without personal commitment. Roy Clouser, who Newbigin cites, argues that all knowledge has a religious presupposition. Clouser’s idea is that everyone takes an aspect of reality or thought to be absolute, obtaining independent existence and being the foundation to all other thought. Sometimes these assumptions are unarticulated, but they are religious in that they determine every other thought. Newbigin derives some of his argument from Polanyi’s argument for personal knowledge. Personal knowledge is knowledge claims that implicitly rely on personal judgments. A personal judgment is a commitment from which other claims are evaluated. A knower stands in relation to her environment as a participant. Tacit knowledge is what we know but cannot tell. Polanyi's claim was that tacit knowledge is what all other knowledge is grounded in. Tacit knowledge is seen in activities that are done without analysis such as playing a piano or riding a bike. The knowledge required is incommunicable and cannot be expressed verbally. Tacit knowledge is gained through linguistic communities that shape the traditions of its members. Christian discipleship is a human activity that is composed of a narrative and a set of practices. The authoritative/normative “memory” is the Bible. The Bible “embodies the story that shapes and interprets the community.” (87). Newbigin’s critique of the modern search for certainty is to be commended. However, one wonders if confidence is a replacement for certainty or something else altogether. The confidence with which one holds one’s beliefs is a subjective certainty, but the modern project was aimed at discovering some objective certainty. Merely suggesting that we are properly confident invites us to ask what it is that compels such confidence and what makes it proper. Even if we grant the no-neutrality thesis and the tacit-knowledge thesis and even accept that the modern project was misguided, what exactly is the answer Newbigin wants us to entertain to the question that Descartes asks? Just what makes a belief, confidently held or not, to be a good one? The psychological answer appears to be that we are made confident by personal choice, inculcating scripture within the context of a group of fellow believers. All well and good, but this description of how believers grow in confidence does not tell us why they should be confident. Perhaps in Newbigin’s framework there is an available answer. Fundamentalists are guilty, according to Newbigin, of treating the Bible in a modernistic fashion. Facts are all indubitable and certain from scripture. This is in contrast, Newbigin suggests, to the appropriate, more experiential, way of reading the Bible. The mistake, Newbigin suggests, is to seek such an objective certainty. Inherency, for Newbigin, gets in the way of confidence in that it drives us to seek certainty. However, there seems to be no compatibility issue with reading the Bible in both ways. Why not hold that the Bible is without error factually in addition to producing the experience of closeness to Christ? Indeed, this is what the fundamentalists were so keen to say. That modernism was a part of what drove their hermeneutic may be true, but one does not have to be a modernist to be an inerrantist. Why not, instead, propose that we retain this foundation. Indeed, inerrancy appears to have been the common assumption of the early church and therefore not a particularly modern assumption. Newbigin does highlight a pre-modern conception of knowledge and presents a historical argument for the Augustinian model of faith seeking understanding. It would have been interesting to develop this model in response to modern challenges. It might have been interesting to explore further contexts in which certainty might be a valid and quite Christian concept. Calvin, for example, did not shy from claiming certain knowledge of God. Clearly, Calvin’s idea of certainty was not identical to Descartes. After all, Calvin's definition of faith was "certain knowledge."